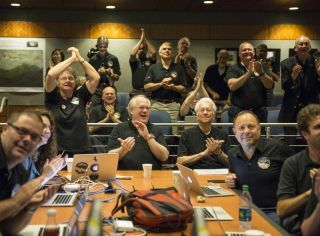 Members of the New Horizons science team at the Johns Hopkins University Applied Physics Laboratory in Laurel, Maryland react to seeing the latest image of Pluto shortly before the spacecraft flew by the dwarf planet on July 14, 2015. LAUREL, Md. -- As NASA's New Horizons team members wait in anticipation for the spacecraft to check in with them tonight (July 14) after its historic flyby of Pluto, they'll be making sure not to jinx the mission. New Horizons zoomed within 7,800 miles (12,500 kilometers) of Pluto at 7:49 a.m. EDT (1149 GMT) today, hopefully collecting the first up-close images and other data about the dwarf planet system. But the spacecraft's handlers won't know how things went until they get a status update from the probe, a report that is expected to come in at about 9 p.m. EDT tonight (0100 GMT Wednesday). So team members avoid talking about the things they fear most — and feel the need to knock on wood if someone slips up and mentions a potential problem. About a year after New Horizons' January 2006 launch, Bowman made such a comment and then said, "Knock on wood," said mission principal investigator Alan Stern, of the Southwest Research Institute in Colorado. Stern looked around and realized that the mission control center at APL had no wood to knock on. He went out and bought several small wooden cutting boards to put around mission control, then branded them with New Horizons stickers. "People have them on their desk a decade later," Stern said. Another tradition has to do with the many hibernation periods New Horizons endured. As part of the push to keep costs down, the spacecraft's guidance and control systems were shut off multiple times over its 3-billion-mile (4.8 billion km) journey to Pluto. While some hibernation periods lasted just a few weeks, the probe slept for a whopping 262 days back in 2008. New Horizons is able to sleep for 365 consecutive days, a full Earth year. For the first hibernation, Bowman brought a small stuffed bear into mission control. Soon the bear had a small pillow and blanket. Bowman made it a yellow nightcap with a blue ball. "When it was time to wake up, I went in, and it had a green party hat," Bowman said. Colored streamers were added over the next couple of weeks. The hibernation bear became a tradition. Each time New Horizons shut down, the bear would be laid down and covered up. In December 2014, New Horizons had its final wake-up call before today's Pluto flyby. The bear now sits, alert, with a party hat on its head. "He'll be sitting there for a long time, until we've got the data down," Bowman said. Follow Nola Taylor Redd on Twitter @NolaTRedd. Follow us @Spacedotcom, Facebookor Google+. Originally published on Space.com.